I’ve been receiving the most beautiful greens in my CSA this summer. Every week they are a perfect blank canvas for a new salad creation. 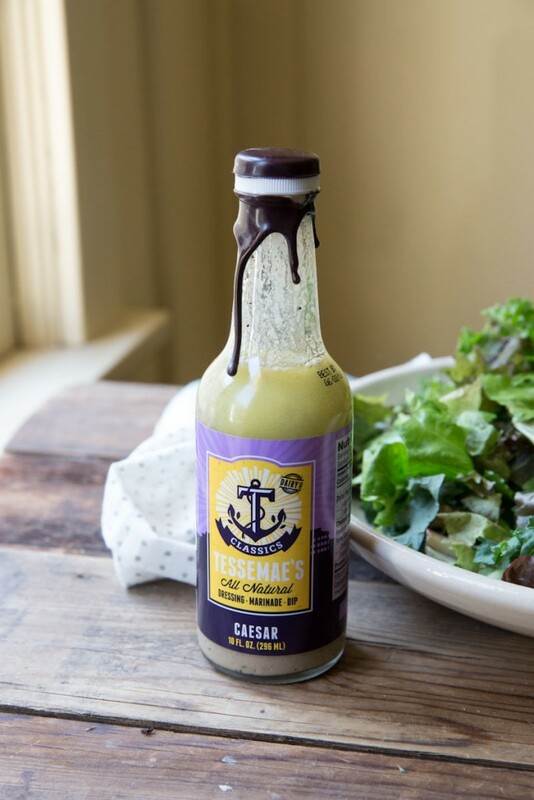 When I was asked to try out Tessemae’s all natural dressings, the timing couldn’t be more perfect. 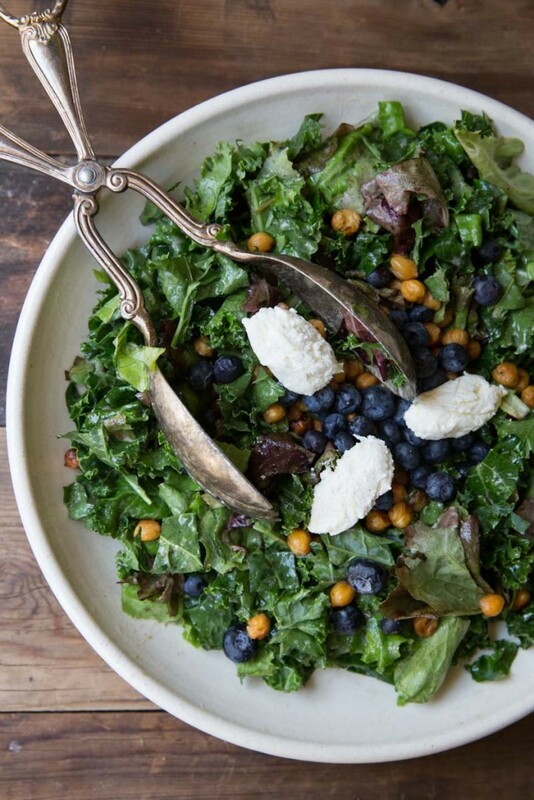 As blueberries are in abundance right now, I was reminded of this salad. I had a similar salad months ago at a resort in Park City. 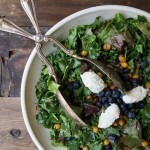 I loved the combo of sweet blueberries, crispy chickpeas, savory caesar dressing and smooth ricotta. I put the idea on my long list of recipe ideas then forgot about it until I spotting the blueberries. This was the perfect excuse to buy more berries and make my favorite homemade ricotta. As for the honey spice roasted chickpeas, the only problem here is that we had to save some for the salad so we can’t eat them all straight from the sheet pan. Everett and I both love to nibble on these as a snack. While this salad could definitely be simpler, the additions of homemade ricotta and roasted chickpeas are definitely worth your while. And you do save some time by using a store-bought dressing . I promise you that making homemade ricotta is way easy and once you make it you’ll be making it all the time. 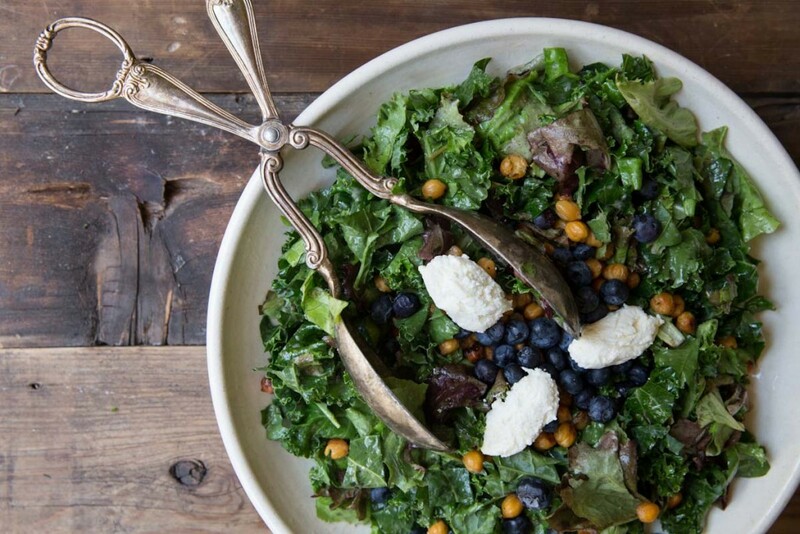 But if you want to serve this salad but don’t have the time for those two extra steps, simply use chickpeas from the can, drained and rinsed, and a nice store bought ricotta will do the job! As for the dressing, I love that I can read the ingredient list with no problem on the back of Tessemae’s dressings. Straightforward additions that, even by reading, you know will taste good. The creaminess comes from coconut milk instead of eggs so the dressing is actually vegan, along with being gluten free and lactose free. Their caesar dressing is also whole 30 approved and paleo approved. The background of the dressing is quite charming even beyond it’s labeling. The dressing recipe started with a mom of three boys, who was trying to find a way to get her boys to eat their veggies without serving them salad dressings filled with artificial ingredients. One of her boys enjoyed the dressings so much that he suggested starting a business to bring them to the world. If you have ever made salad dressing from scratch you know that if you store it in the fridge the oils solidify and you must bring it back to room temp before using it. The same goes for Tessemae’s Dressings. This is a good sign! The dressings haven’t spoiled. So, if you’re using a Tessemae Dressing, or any all natural dressing, place it on your counter as you chop ingredients or for a quick solution, place the bottle in a small bowl of warm water. Shake then add to your salad. Tessemae is giving a discount to my readers interested in trying out their dressing. Enter YummyTesse at their online checkout for 10% off all orders from Tessemaes.com. 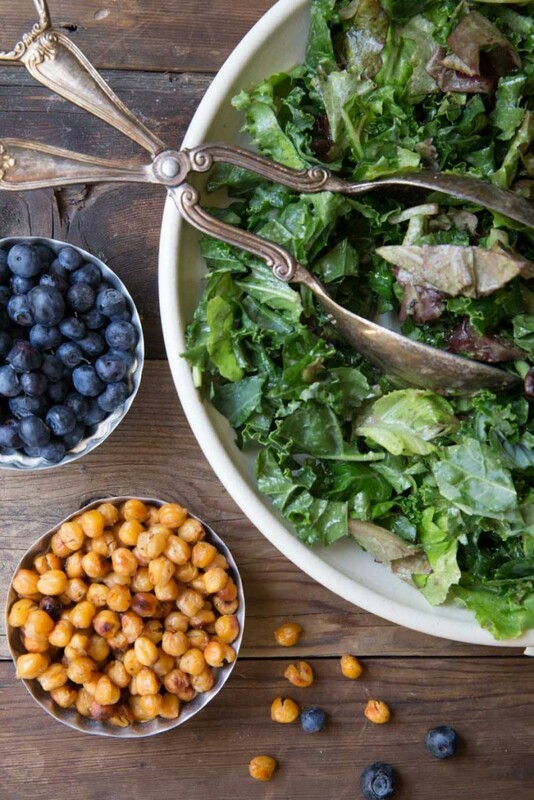 Kale Caesar Salad with fresh blueberries, honey spiced roasted chickpeas and creamy lemon ricotta. Salads don't get much better than this! 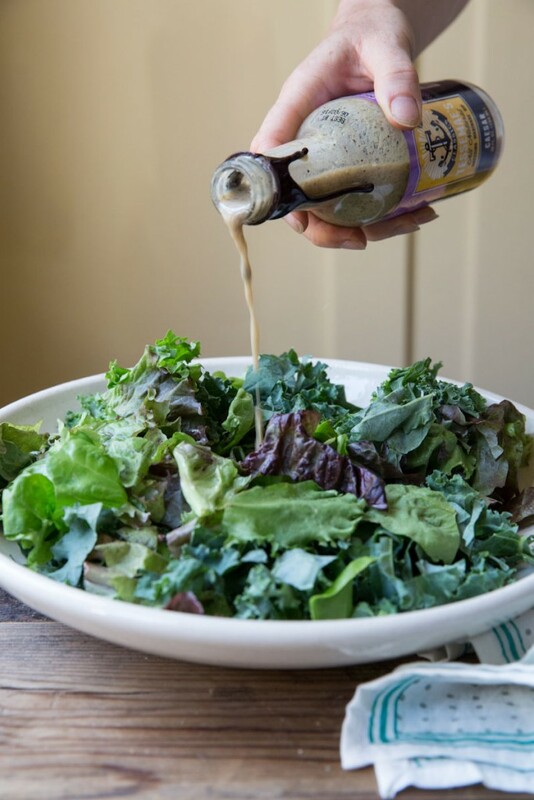 Bring the salad dressing to room temp by placing the bottle in a small bowl of warm water. The oils will soften and un-solidify so then you can shake up the dressing to combine all of the natural ingredients. 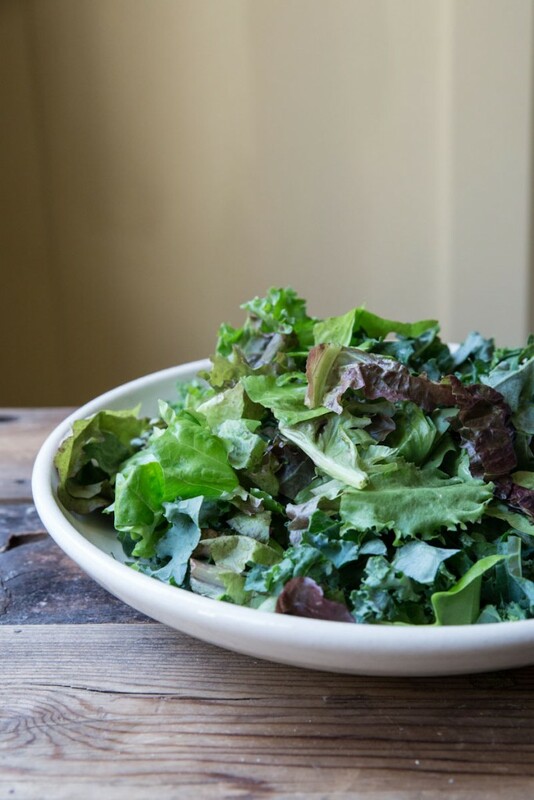 Toss the kale and mixed greens with the caesar dressing. Add in blueberries and chickpeas. If you don't have the time to roast the chickpeas, you can just drain and use the ones straight from the can. Combine the ricotta with sugar, lemon zest and juice then spoon it onto of the salad or onto individual salad plates. This post is sponsored by Tessemae’s Dressings. All opinions are my own. This looks fantastic! I love the addition of ricotta, I never would have thought to do that. I’ve only ever had kale salads in restaurants, I never make them myself, but I think that is about to change!